Tires are one of the most crucial parts of a vehicle, so when they fail, they can cause drivers to lose control of their vehicles and cause devastating accidents. Tires need to meet strict safety standards to keep drivers safe in their vehicles, but sadly not all tire manufacturers comply with these regulations. When this occurs, innocent people pay the price. Defective tires aren’t just dangerous for the driver and their passengers, but they are dangerous for everyone on the roadway. Tread Separation – Tires have many layers that stick together to form a durable tire; however, if tires are not manufactured properly, these layers can separate during vehicle operation. Adhesion Failure – The layers of a tire are held together with adhesives. If the adhesive is not applied properly, or if a manufacturer uses a substandard adhesive, these layers can fall apart. Sidewall Failure – Poor manufacturing could cause a failure on the side of a tire. When a failure occurs on the tire sidewall, it often causes a blowout. Bead Failure – The bead is the inner edge of the tire that holds tight to the tire’s rim, allowing the tire to remain inflated. Bead failure can not only cause the tire to deflate, but can also cause the tire to become detached from the rim. Poor Materials – Sometimes tire manufacturers use inferior materials in the manufacture of their products. Manufacturers may do this to try to lower costs, but it puts drivers and passengers at a serious risk of accidents. Tire defects are incredibly dangerous because blowouts can cause rollover accidents, which have a much higher fatality risk. 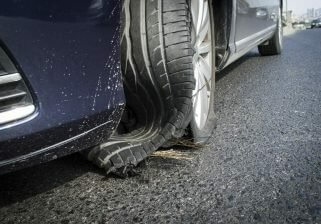 Tire blowouts can also cause drivers to collide with other vehicles and pedestrians on the roads. Recent years have seen millions of tires recalled from the market due to defects. Unfortunately, companies only learn of these defects after they have caused serious injuries or even deaths. Tire manufacturers should not put dangerous products on the market, so when they do, the products not only need to be recalled, but the manufacturers need to be held responsible for the resulting damages. Determining the cause of a car accident can be very difficult. If a defective tire is suspected of causing an accident, it will not be easy to prove the tire was at fault without the help of an experienced tire defects lawyer. After an accident, a lawyer will be able to not only investigate the scene, taking photos and conducting interviews, but also preserve important evidence. An experienced lawyer will engage the help of experienced accident reconstructionists and tire experts who can evaluate the accident, the tire in question, and determine exactly how the accident occurred. Tire manufacturers are experienced at fighting lawsuits. The often try to minimize claims and intimidate victims, but with an experienced lawyer on your side, you can stand up to these negligent companies. When tire defects cause accidents, victims often suffer very serious injuries that not only require emergency medical treatment, but that may also require surgeries, long-term physical therapy, and specialty medical treatment. Victims can receive compensation to cover all medical expenses, including future medical expenses, pain and suffering, lost wages, lost earning capacity, permanent disfigurement, and punitive damages. At Sahadi Legal Group, there is absolutely no upfront cost for working with us. We offer free, no obligation consultations, and you won’t owe us anything unless we help you recover compensation. We will investigate your case, protect your best interests, and pursue the maximum compensation for tire defect victims. Why Hire Sahadi Legal Group? At Sahadi Legal Group, we have extensive experience with all types of products liability claims, including auto products liability. Our experience allows us to bring a wealth of knowledge other law firms just can’t offer. We are dedicated to getting justice for our clients, so we make sure they understand their legal rights, the process of filing a lawsuit, and how we will work to pursue every avenue of compensation. If you were in a car accident and you believe a tire failure is to blame, don’t wait to call Sahadi Legal Group. The sooner you contact us, the sooner we can start protecting your rights and pursuing compensation.